A 60th Wedding Anniversary is a big celebration for all family and friends, the chance to show your Anniversary couple just how much they mean to you all and you want it to look great too. A traditional theme of Diamonds for your 60th Anniversary will make your party sparkle. Before you go out and buy every possible 60th Anniversary themed decoration it is a good idea to have a plan. At this point you will know the room that you will be holding the celebration. Where you hold the party will depend entirely on your Anniversary couple, it may be that they will prefer to be in their own home, their favorite restaurant, their place of worship or they may want a massive party in a big hotel. If it is the evening then you could have fairy lights or candles in jars lighting the path. Decorations outside make everything feel magical! Visualize the room where you are having the Anniversary Party and think about where the furniture will be as it might be in a different place than normal. Also, are there any areas in the room that you would like to hide? If you are having a sit down meal or want seating for your guests to be able to chat over the good times it is a nice touch to have decorations that add to your 60th Anniversary party theme. 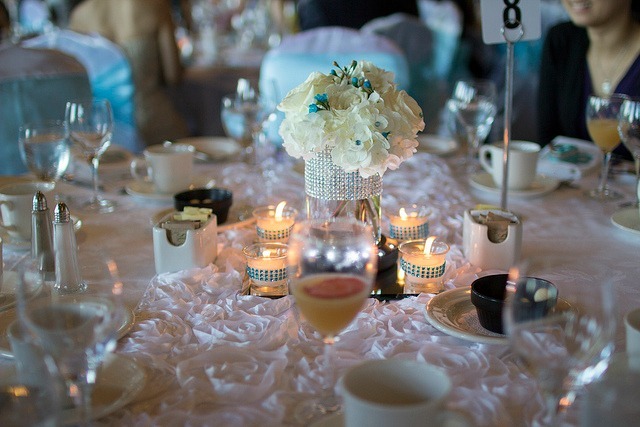 Flower centerpieces will always look gorgeous and you can add little "diamond" gemstones to the arrangements.